Just the thought of going to the gym makes a lot of us uneasy. It takes a lot of time out of your busy schedule to be able to get a good workout in. The SMART Pro 5000i lets you exercise in the comfort of your own home while allowing you to follow along with personal trainers around the world. The SMART Pro 5000i comes with a 1-year iFit membership, giving you full access to an expansive collection of worldwide workouts and an ever-growing library of limit-pushing studio workout classes that will get you moving and sweating on and off your machine. We consider incline training the treadmill game changer—you can realistically condition your body for those challenging uphill routes. The SMART Pro 5000i offers powered, automatic incline adjustability. When you train with incline, you know you’re giving your legs the best workout possible on a treadmill. For the complete real-world experience, take your grade into the negative for the full range of training. When you work out with our trainers, you’ll be taken up hills and through valleys at all sorts of speeds. The motor on the SMART Pro 5000i sports a heavy 3.75 continuous horsepower drive system that’s guaranteed for life not to fail you no matter how often your incline or speed changes. The best training comes from following someone who knows what they’re doing. And what better place to work out than inside your home? The SMART Pro 5000i brings knowledge and convenience together to give you the right tools to reach your fitness goals. The last thing you need is something taking up more space around your house. That’s why we engineered the SMART Pro 5000i with SpaceSaver® Design, so you can conveniently fold the deck up and out of the way. And as an added bonus, we built in a powerful shock called EasyLift™ Assist that helps you lift the deck with an easy push. Give your legs plenty of room to get moving. The expansive 60” length is long enough to let you stretch out your stride, and the huge 22” width provides you with loads of comfortable elbow room. To ensure our treadmills are top quality, we test each belt for one million cycles at double the user weight before release. Stay captivated and motivated as you follow along with your favorite trainers guiding your workout through beautiful scenery around the world. With a 10” touchscreen, It’s also easy to swipe through and view your workout stats. When you step on the deck of a ProForm treadmill, you get instant access to professional training programs fully loaded and ready to go. Enjoy challenging workouts focusing in on your goals. 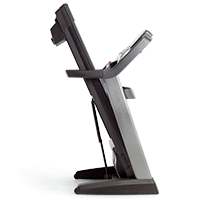 The SMART Pro 5000i features Incline, Calorie Burn, High Intensity, Speed, and Mixed workouts. Just press “Start” and you’re off. Not everybody runs at 12 miles per hour. But it's nice to know this treadmill can totally handle it. Thanks to a bigger motor size and faster flywheel gear ratio, the SMART Pro 5000i rocks a top speed of 12 mph. Our in-home efficiency booster means you can run every day without using excessive amounts of electricity. And the convenient QuickSpeed® buttons let you adjust your intensity instantly, so you can stay focused through every step of your workout. Heart rate monitoring helps you stay on course for your fitness goals. By working within the aerobic zone, you are building endurance while burning through your body’s fuel storage. When you train in the anaerobic zone, you are improving your overall speed and time performance. The SMART Pro 5000i features two hand-grip heart rate sensors that are conveniently built into the handlebars. Built with the whole family in mind, the SMART Pro 5000i treadmill accommodates up to 300 pounds per user. Tune in to a better sound system. The included audio auxiliary port allows you to plug in and listen to your entertainment at a higher volume. The built-in dual 2-inch Bluetooth speakers let you hear your music or videos wirelessly with even less complication. Experts have learned that we actually increase or decrease our pace to match the tempo of our tunes. Plus, music has also been proven to lower perceived exertion. That’s great news. Incline training adds resistance to your everyday workout, burns more calories, and increases muscle tone. The SMART Pro 5000i offers powered, automatic incline and decline adjustability. For the complete real-world experience, take your grade into the negative for the full range of training. We know that a quality product is all about the details. That's why we've built the SMART Pro 5000i with 2.5-inch precision-machined, balanced, non-flex rollers. Large belt rollers decrease tension, which keeps wear and tear to a minimum. You'll also notice less noise and better grip. So, just in case you were wondering, we care about the little things, too. We want to help you protect your investment. That's why we try to go above and beyond with our product warranties. The SMART Pro 5000i is protected with a Lifetime Frame & Motor Warranty, 5-Year Parts Warranty, and 2-Year Labor Warranty.